Peter Macias of Pomona, California, is new to the game, but they tell us that he’ll do what needs to be done to play with the big boys. Peter didn’t build his ’61 Impala as a show car; he built it for the streets. He began by pulling the car off of the frame and going through it completely. Peter acquired a new GM Performance crate engine and the first thing on the agenda was to take the block to Primo Restorations for Candy Oriental Blue paint before dressing it up with chrome and accessories. 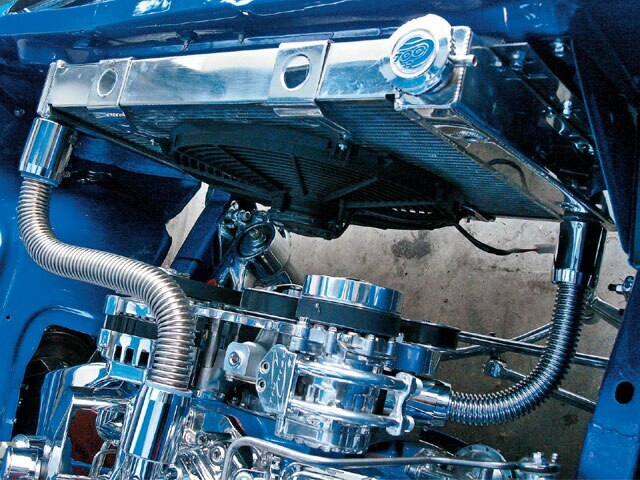 Peter wanted bling and performance, so a chrome intake from Professional Products was used on the top end. An Edelbrock Endurashine carburetor was plumbed with AN fittings so that it could be hard-lined. The fuel lines were all hand-bent in 31/48-inch stainless steel tubing. 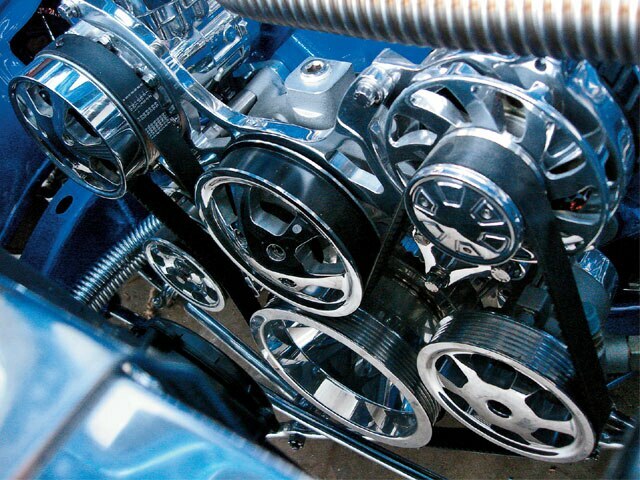 An aluminum Billet Specialties Tru Trac belt and pulley system keeps the engine operating properly. 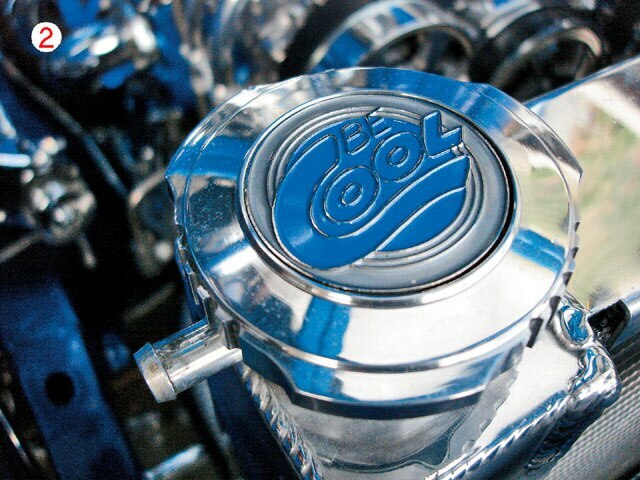 A Be Cool aluminum radiator was used to keep the fluids flowing and cool off the chromed-out engine. 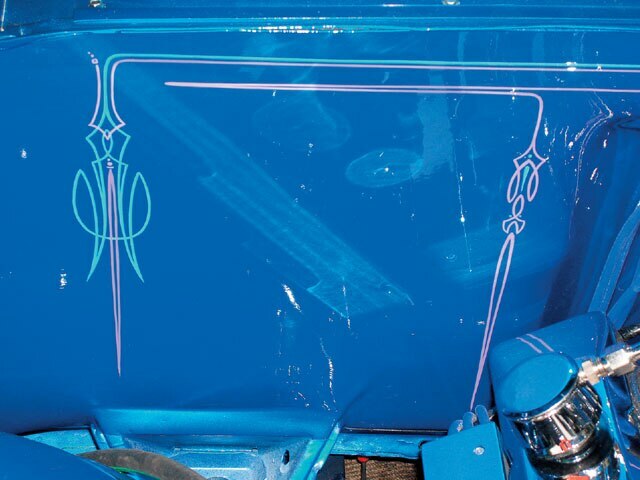 To tie the engine compartment to the car’s exterior, the firewall was shaved and painted, and the fenderwells and core support were powdercoated and dressed up with chrome trim. Peter put this engine compartment together in about five weeks, and he couldn’t have done it without the support of his family and friends who helped him out on this build. We hope to see this car featured soon in LRM. If you feel that you have an engine worthy of our From The Hood section feel free to contact us at saul.vargas@sourceinterlink.com. 1. A Billet Specialties Tru Trac serpentine setup with an A/C compressor keeps the belt turning true.2. 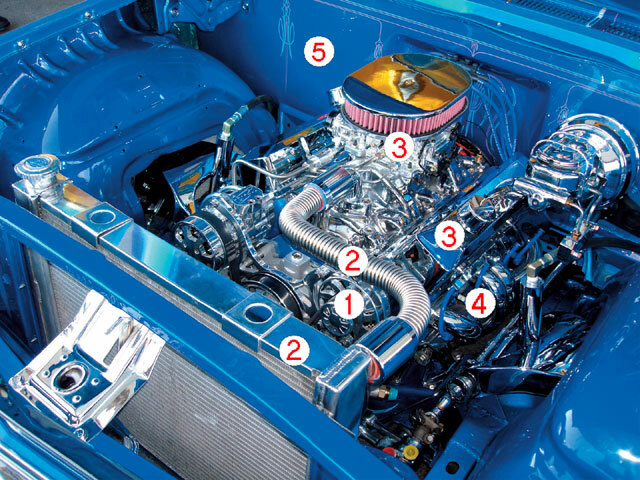 A Be Cool radiator with compartment-complementing Cool-Flex hoses keeps the engine running cool.3. Chrome Proform valve covers dress up the Edelbrock Endurashine carburetor and Professional Products chrome intake combination. A Holley race pump feeds the carb.4. An Optima battery powers up the system. An MSD distributor sends the spark through Taylor silicone plug wires.5. Chrome and paint were used throughout the engine compartment to tie into the exterior of the vehicle. Cool-Flex hoses and steel-braided lines further highlight the compartment. A Be Cool radiator with compartment-complementing Cool-Flex hoses keeps the engine running cool. Chrome Proform valve covers dress up the Edelbrock Endurashine carburetor and Professional Products chrome intake combination. A Holley race pump feeds the carb.